For those who might not know, MIDI stands for Musical Instrument Digital Interface, and has been a standard protocol since 1983. Many people are surprised to learn that it doesn’t actually send any sound over the wire! In fact, MIDI is a serial protocol. Instead of sound, it sends abstract notes, and other data like key pressure, pitch bend and more. MIDI cables are typically hooked up to a MIDI capable synthesizer, which reads the NOTE-ON / NOTE-OFF (and more) messages and turns them into actual sounds. These days physical synthesizers are being replaced by personal computers running synthesizer software. Luckily it’s easy to get a MIDI-to-USB cable and use MIDI devices with modern synthesis techniques. 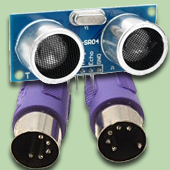 This project uses an Arduino micro controller to speak the MIDI serial data protocol. My MIDI-to-USB cable coverts the MIDI into something my PC understands, and I can synthesizes the notes. You might think it’s round about to use MIDI if the data is going to be converted to USB anyway, and Arduino already supports USB. But my reasoning is two-fold. First, making it MIDI means it would work with old and new hardware, and some classic hardware is still very desirable these days. MIDI is an extremely common format in the music world, and being able to make MIDI devices appeals to me. Second, even if I were to use the Arduino’s USB to send MIDI, I would have to write or hack together a driver for Windows, Mac and Linux to support my hardware. Yuck. By using a MIDI port, anyone can use their MIDI-to-USB cable that should already be configured with their PC, and their favorite music applications. 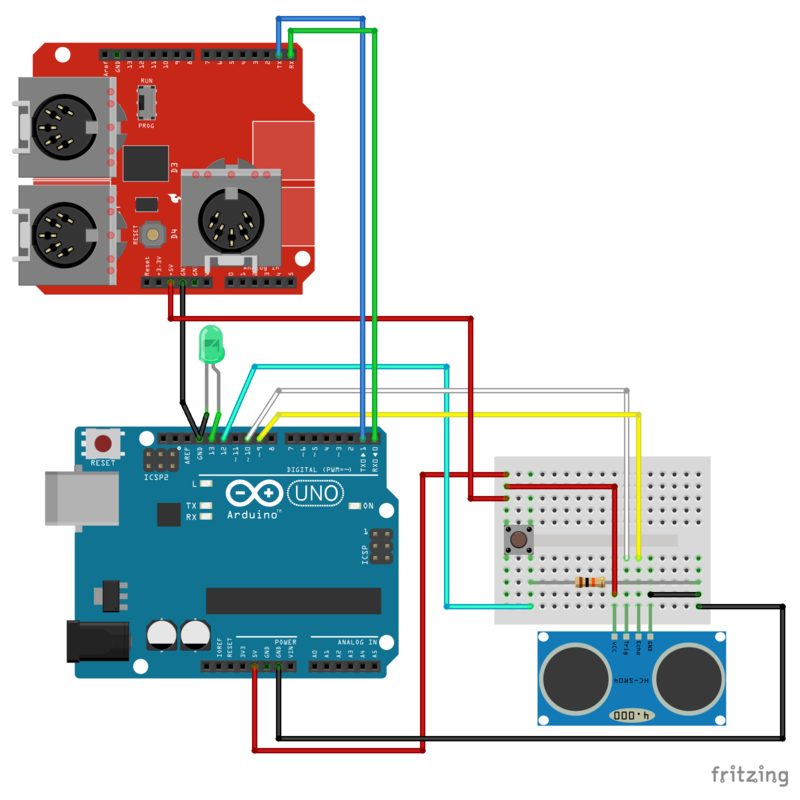 Below is a diagram of how I set up the circuit, pretty simple stuff. There are a couple different types of Ping Sensors, but I used an HC-SR04. The software I used to make the diagram didn’t have the proper MIDI Breakout Board, so I used the MIDI Arduino Shield and tweaked the drawing a little bit. The wires are correct, but the drawing looks a little off. Basically, it should be the breakout board and not the sheild version. Either way, the the wiring is correct. Make sure to check out the video afterward to see it in action! Could you please help explain to me How do I set up the code?